Have you wanted to travel to Africa for a real safari ever since you could identify a giraffe? 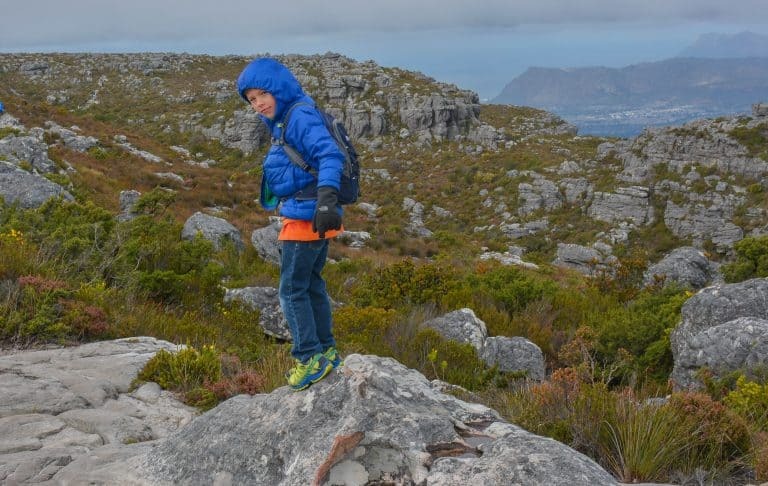 Or, have pictures of Cape Town’s Table Mountain and scenic coastline recently inspired you to consider a South Africa vacation with the family? 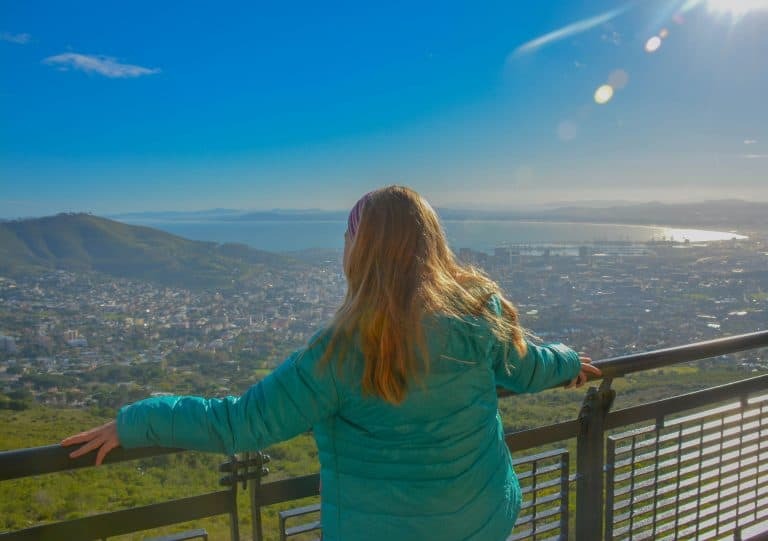 Either way, South Africa is a diverse travel location where families can learn the history of Nelson Mandela and apartheid, enjoy a day at the beach, go on a safari, and zip line across waterfalls. 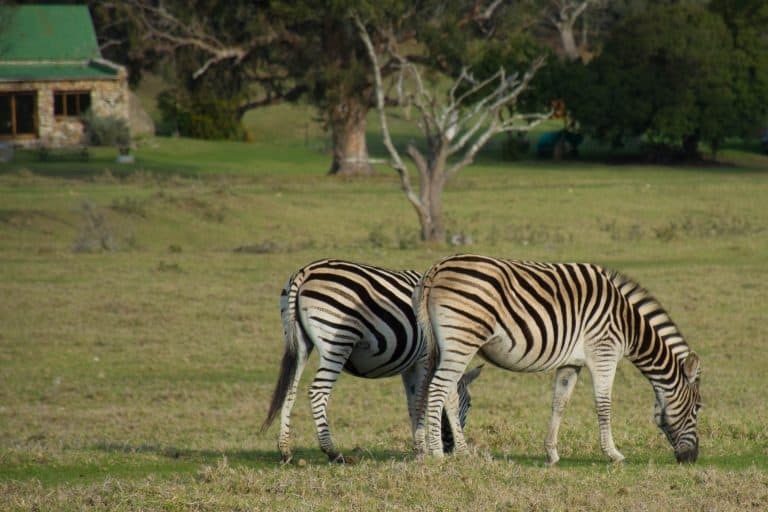 A Garden Route South Africa road trip itinerary can accommodate the interests of every member of your family from the history buff to the adventure traveler to the future zoologist. Did you know that South Africa is a great road trip destination? Yes, it can be challenging at first for Americans to drive on the left side of the road. 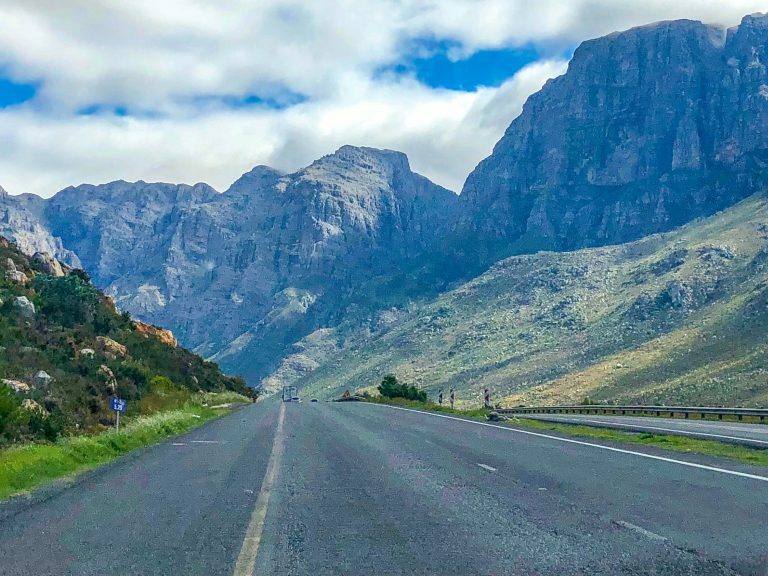 However, the Garden Route in South Africa, located along a 190 mile stretch of coastline between Storms River and Mossel Bay, is a great road trip for families. There are several towns along the Garden Route that offer kid-friendly restaurants and beaches. Our family was happy to discover that many of the gas stations along the main highway even have play structures for kids. 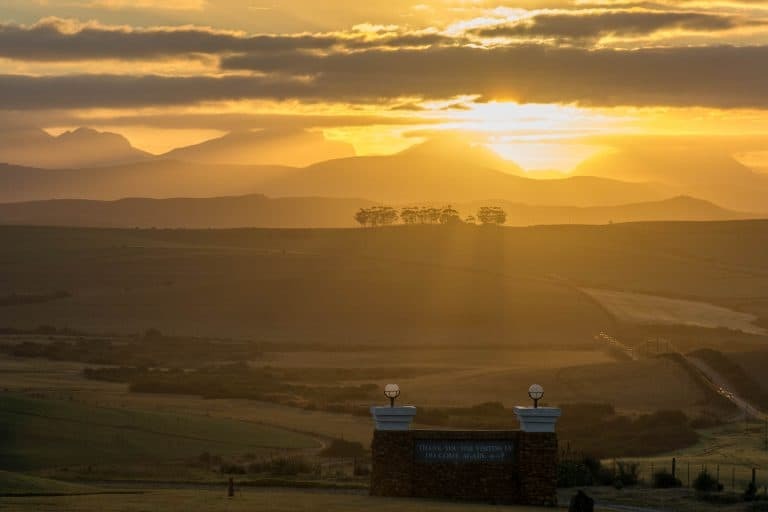 While the family-friendly nature of a Garden Route South Africa vacation may be surprising to many Americans, South Africa is already a popular vacation destination for European families. The starting point of the Garden Route South Africa in Mossel Bay is located about 250 miles from Cape Town. That’s about a 5 hour drive. Many tourists take a day to drive between Cape Town and the western part of the Garden Route. Short detours from the highway offer whale-watching opportunities, beaches that are home to penguins, and the southernmost point of the African continent at Cape Agulhas. We’re an affiliate of Booking.com. 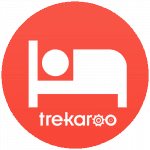 When you book through us you get the same lowest price guarantee and help to keep Trekaroo free. When my family began planning our South Africa itinerary, we quickly decided that we wanted to start our vacation by flying directly into Cape Town. Cape Town’s location near South Africa’s Garden Route is quite convenient. While we planned almost three full days for visiting Cape Town in our South Africa vacation itinerary, our stop there was cut short. Our family was delayed in London because I forgot my children’s birth certificates back home in the United States. Ultimately, we worked out the issues, but we did arrive a couple of days later in Cape Town than we had planned. Thus, we had to forego a zip line adventure, trip to Robben Island, and general sight-seeing around the city of Cape Town. Let this serve as a reminder to parents traveling to South Africa with their children, do travel with a copy of your children’s birth certificates. And, if you are traveling without one parent, double check that you have all required paperwork notarized. Our airline was super strict about making sure that we had all proper paperwork before being checked into our flight. Ultimately, we were able to spend only about 24 hours in Cape Town. Fortunately, Our accommodation in Cape Town was still able to accommodate us for one night. We thankfully had beautiful clear skies to explore the Kirstenbosch National Botanical Garden the afternoon of our arrival in Africa. After our 12-hour flight, letting the children run free in the botanic garden was the perfect way to stretch our legs and acclimate ourselves to the wintry weather. 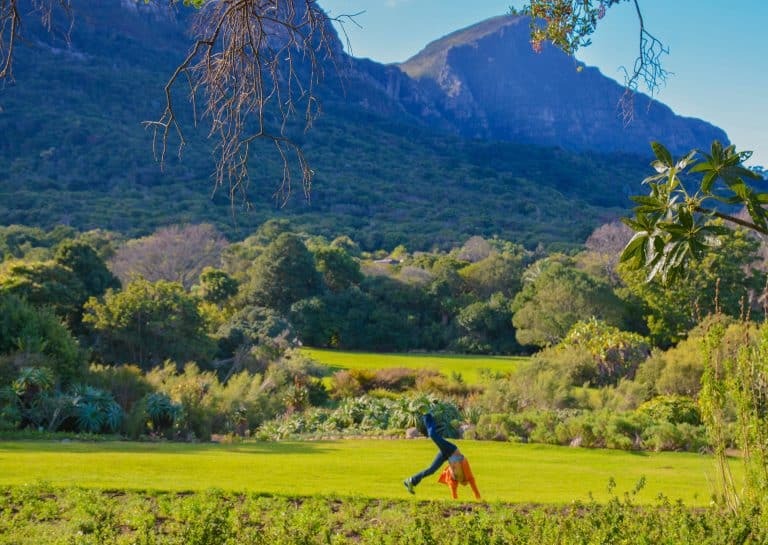 Families visiting Kirstenbosch National Botanical Garden can cross scenic bridges, play in cool streams, spot local waterfowl, and do cartwheels in the garden’s grassy fields. After a couple of amazing meals at Da Vinci’s on Kloof, just a few blocks from our apartment, and a good night’s sleep, we awoke to clear skies and an amazing view of Table Mountain on the first morning of our South Africa vacation. We had been optimistic that Table Mountain would clear enough for us to take the cable car up to the top, and it did. If you’ve seen a photo of Cape Town, it likely showed Table Mountain towering over the city and the Atlantic Ocean. There is a reason why Table Mountain is one of the world’s iconic travel destinations. The views from the top of the mountain are stunning in every direction –as long as they are not obscured by clouds. 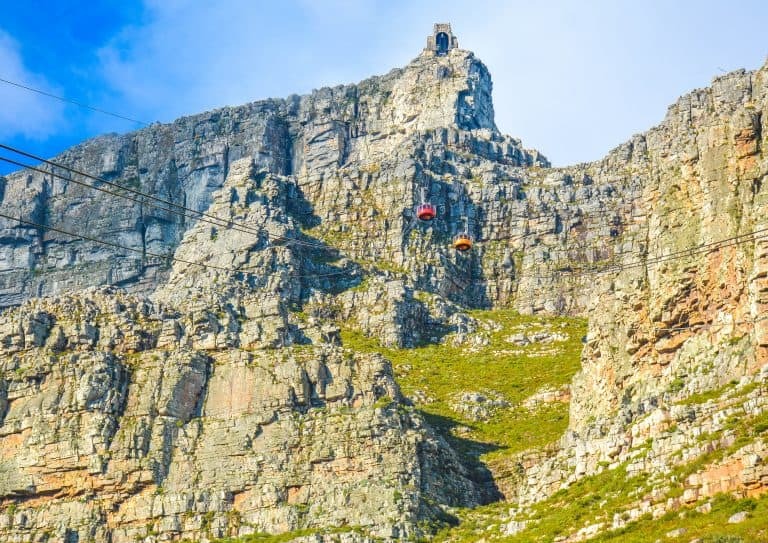 Tickets for the aerial cableway up Table Mountain can be purchased in person or online. We actually purchased our tickets online while waiting in line and were able to change to a quicker line. Lines for the aerial cableway to the top of Table Mountain are notorious for being quite long. As we stood in line for about a half hour at the beginning of the day, we watched as the clouds began to roll in. We were thankful that we had moved quickly when we saw the skies were clear. At the top of Table Mountain there are pathways, trails, and a café. It is actually possible to hike up the top of the mountain itself. Most families will want to allocate at least an hour or two at the top to walk around and enjoy the view. Being a cold, windy, winter day, we walked the paths, hot chocolate in hand for about an hour until the clouds enveloped the top of the mountain. 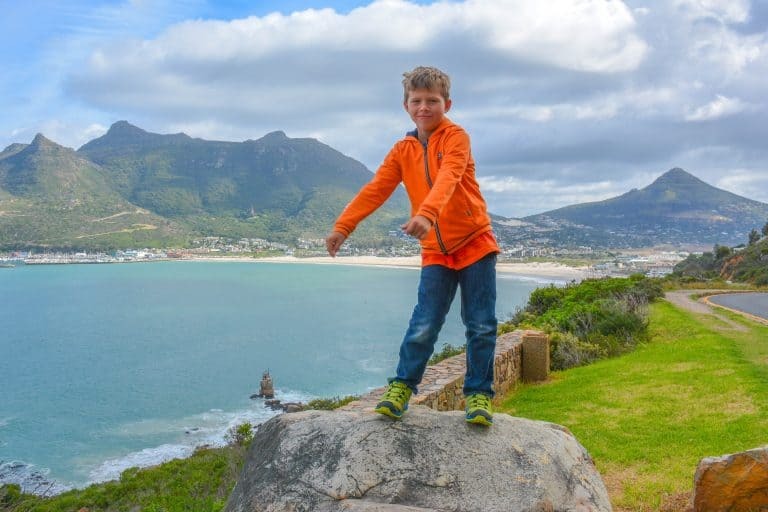 Most families visiting Cape Town will choose to spend a full day exploring Cape Point Peninsula on their South Africa vacation. Once again, our family’s experience was cut short due to limited time and stormy weather. We did not have the time to make it to Cape Point, but we were able to drive the scenic Chapman’s Peak Drive and see the colony of penguins at Boulder’s Beach. I do recommend renting a car to explore this area, even if only for a day. Chapman Peak drive is a short, scenic, toll road with stunning views of Hout Bay. The coastline in this area features steep mountain peaks seemingly rising straight out of the ocean. There are pull-outs so that the driver can enjoy the view too, and the entire family can get out for the car for a photo op. 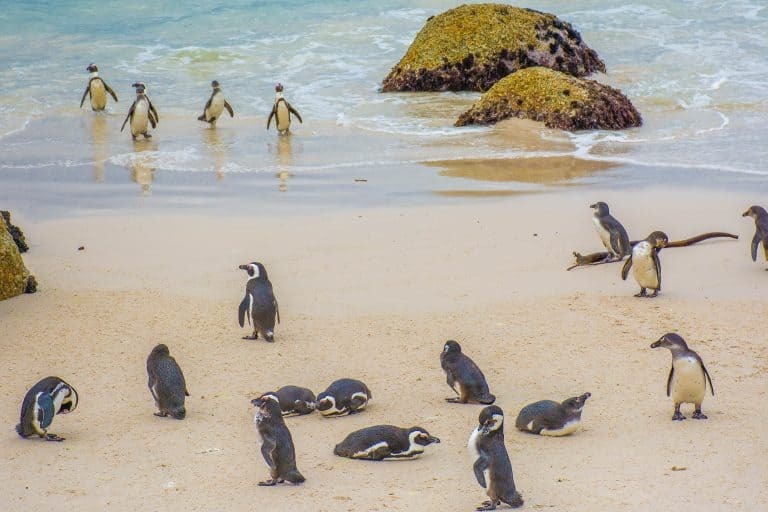 The penguin colony at Boulder’s Beach is no secret among tourists. Arriving there mid-day just before a rainstorm, we saw more crowds at the Boulder’s Beach penguin colony than anywhere else in South Africa. However, once you catch a glimpse of the penguins swimming in the surf, it is easy to understand why it’s such a popular attraction. And, yes, even with the crowds, it’s worth a stop. The most penguins can be seen by walking along a contained boardwalk that keeps the hordes of tourists away from the tiny, playful birds. However, it is possible to climb among the boulders at the swimming area of Boulders Beach, which is adjacent to the protected area where the penguins play. It’s likely that a few brave penguins will be out on swimming beach too. In South Africa, it is generally not advisable for tourists to be driving after dark. So, it is important to plan your South Africa itinerary with enough time to reach your destination for the night before sunset. In the winter months, this means arriving quite early, around 5-6PM, at your destination for the day. Fortunately, many of the places from which families can choose to stay on a South Africa vacation are a destination in themselves. This is certainly true of the Skeiding Guest Farm in Heidelberg. Skeiding Guest Farm offers cabins for families with an outdoor patio where they can enjoy a campfire. Families can choose to have their own braai or to enjoy a fresh meal cooked by the guest farm. The guest farm offers a braai with several choices of protein including ostrich steak from the farm. In the morning families can enjoy a tour of the livestock on the farm including sheep and ostrich. The ostrich on the tour are accustomed to humans feeding them so they will get quite close to guests. Apparently, some of them really enjoy being around people. Another highlight of the farm tour is finding ostrich eggs to bring back to the farm’s kitchen. Upon arriving back at reception, families enjoy a fresh cooked breakfast including ostrich eggs and ostrich bacon. Hoping for a walk along the beach, which never materialized due to stormy weather, our family stopped twice in Plettenberg Bay for lunch. First, we ate at LM in Plett, a chain featuring Portuguese cuisine. On our return visit, we ate at Yellow Wood Spur Steak Ranch, another South African chain. Our safari guide at Lalibela recommended that we stop at one of the Spur restaurants sometime during our South Africa vacation. Honestly, the food is nothing special, but all Spur restaurants have an American Southwest theme. Seeing South Africa’s take on the American Wild West is quite interesting. For families with young children, each Spur location has an indoor play area. Being a touristy town, there is no shortage of family-friendly restaurants available to choose from in Plettenberg Bay. If you have more time than we did in Plettenburg Bay, be sure to take a hike. Hiking at Robberg Nature Reserve is a popular choice for families driving the Garden Route South Africa. 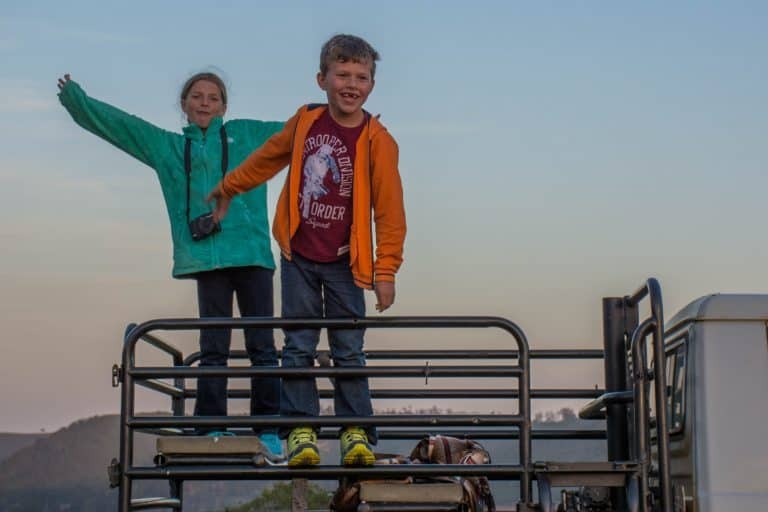 We chose to stopover for a night at Giraffe View Safari Camp on our Garden Route road trip. It is a small, conservation-minded reserve located about 15 minutes outside Plettenburg Bay. Giraffe View Safari Camp offers several cabins for families and groups to rent. Families should be sure to stop at the grocery store in Plettenburg Bay on their way into the camp. There they can pick up firewood, food, and other necessary supplies. We found the grocery stores in South Africa well stocked. It was easy to pick up some chicken and beef for our evening braai as well as yogurt and breakfast cereal. ➠ Find family-friendly hotels in Plattenberg Bay at their lowest prices. Our cabin at Giraffe View Safari Camp had a common room with large glass windows looking out onto an area where antelope were grazing . My kids especially loved the hammock hanging out by the fire pit. The layout of the cabin was a bit odd with the main bathroom being located at the end of a chain of bedrooms. However, the reason to come to this camp is not the amenities but the animals. We loved our personalized safari with the camp’s owner showing us all the various types of antelope. We didn’t see the giraffes on our first try. Thus, we did a mini safari in the morning to go out and find them. Monkeyland is located just outside of Plettenberg Bay. It is part of a group of three conservation-minded attractions in the area. Visitors should plan to spend about 60-90 minutes at Monkeyland. Upon entry and paying the admission fee, families will be assigned a tour group. Tours move with their tour guide on a path around the large open area where the monkeys live. The monkeys eat from stands with food, generally fresh fruit along the path. Most monkeys at Monkeyland roam free and associate with other monkeys of the same species. The monkeys are not tame. However, they are accustomed to people wandering about their environment so they are generally not afraid of humans. 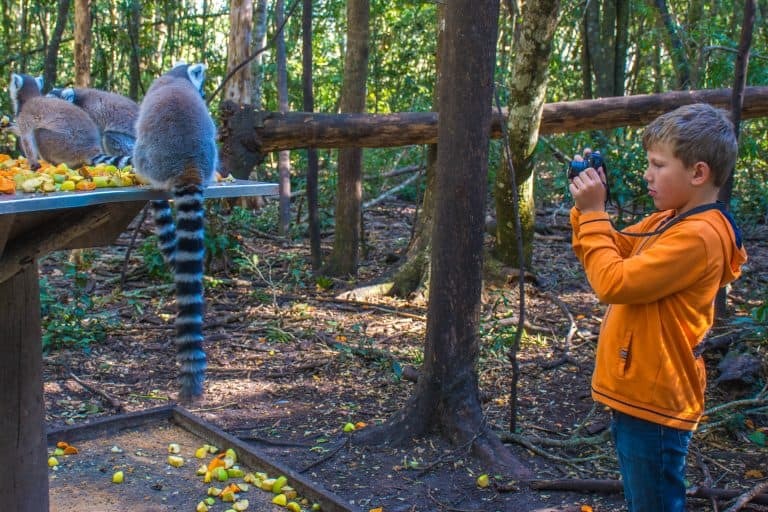 While we saw far more lemurs than local primate species, this is still a fun, unique stop on a Garden Route South Africa vacation with kids. At some point during your South Africa itinerary, you’ll want to plan for a safari. Our family picked Lalibela Game Reserve for our South Africa Vacation due to its family-friendly lodging options. 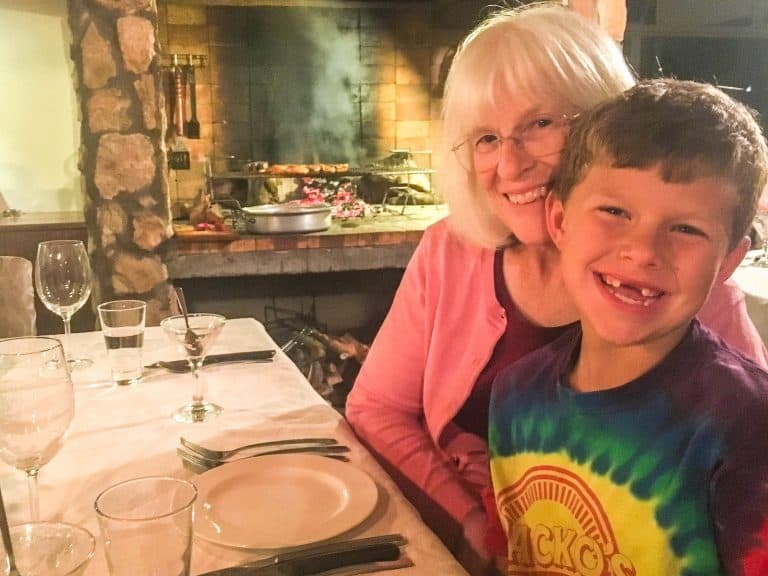 We stayed in a cabin that could accommodate our extended family of three adults and two children. Lalibela is located about an hour from Port Elizabeth not far from the Garden Route South Africa. Visitors to that area of South Africa do not need to take anti-malarial medications. 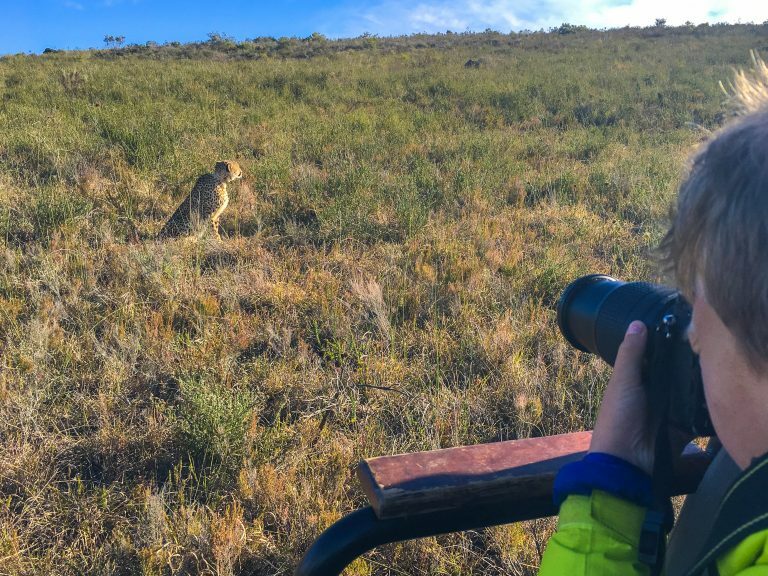 For a complete review of our experience at Lalibela Game Reserve and all our family’s animal encounters on our South Africa Itinerary, check out my article, South African Safari with Kids near the Garden Route. 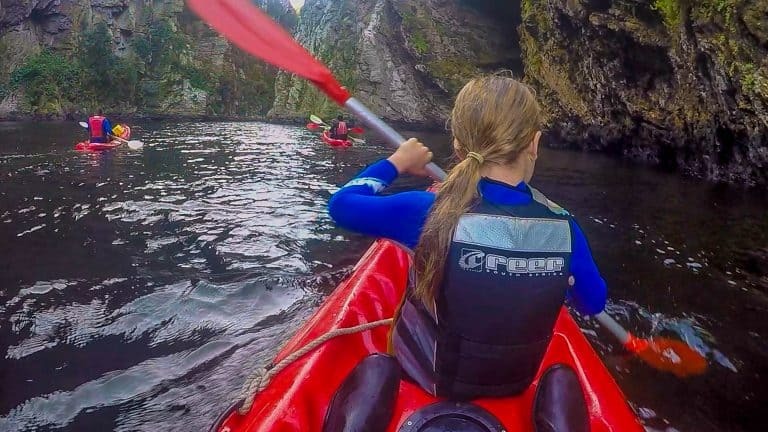 Adventurous families will want to make sure to include a day or two in the Stormsriver area on their Garden Route South Africa road trip itinerary. From kayaking to zip lining, there are a variety of adventures for travelers of all ages. Each activity is only enhanced by the natural beauty of the area where the mountainous landscape is shrouded in green vegetation. Yes, there is a lot of rain in this area, but that generally doesn’t stop the adventure. During our one night in the area, our family chose to stay at the Tsitsikamma Village Inn. It wasn’t fancy, but we did like the fact that there was a restaurant on property. The food at the restaurant was so good that we returned for multiple meals. 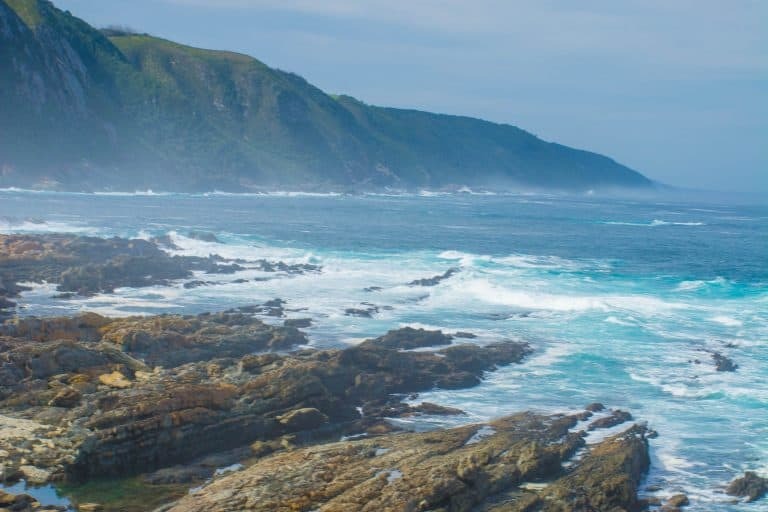 A visit to Storms River Mouth inside Tsitsikamma National Park is really a must do on any visit to the Garden Route South Africa. There are lots of hiking opportunities at the park, including a popular hike out to a series of scenic suspension bridges. The national park also has cabins available to rent with ocean views that are a favorite among families. People from around the world come to appreciate the beauty of this coastline on the Indian Ocean. Supposedly, the ocean is relatively warm here. However, we had to wear wetsuits on our adventures as it was a somewhat stormy winter afternoon. The water was rough the day of our visit, and the waves crashing along the rocky coastline were mesmerizing. At the very end of the road, Untouched Adventures outfits families in wetsuits for a memorable adventure. 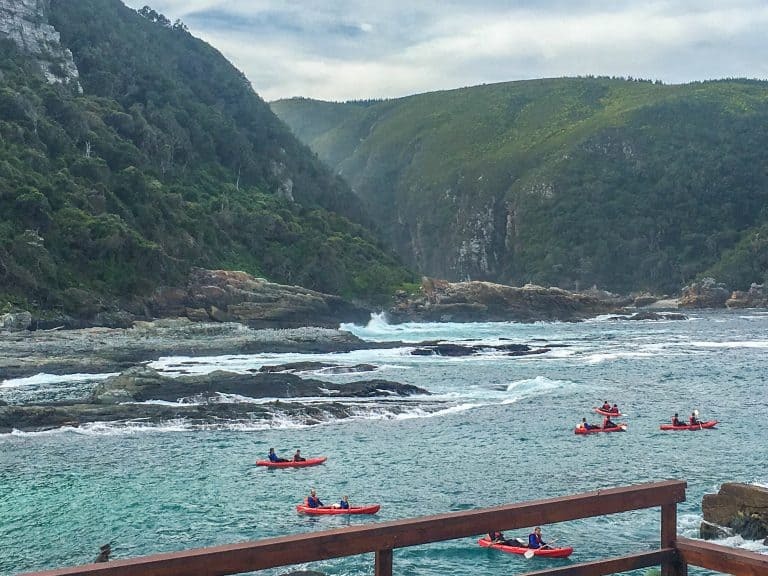 Travelers pair up in double kayaks to brave the ocean waves on a short paddle to the mouth of Storms River. Untouched Adventures keeps a close eye on safety. At the beginning of our adventure, we could paddle through the ocean into the river. However, by the end of our trip the surf had picked up so we walked instead. First, families paddle up the river for a bit through a gorge. Then the tour group ties up the kayaks and continues via personal inflatable rafts called lilos. Adventurers continue paddling as if they were paddling on a surfboard until they reach a small waterfall. Guides challenge the youngsters in the group to balance on their boards standing up before heading back. Prior to returning to the kayaks, there is even an opportunity for cliff jumping in the itinerary. 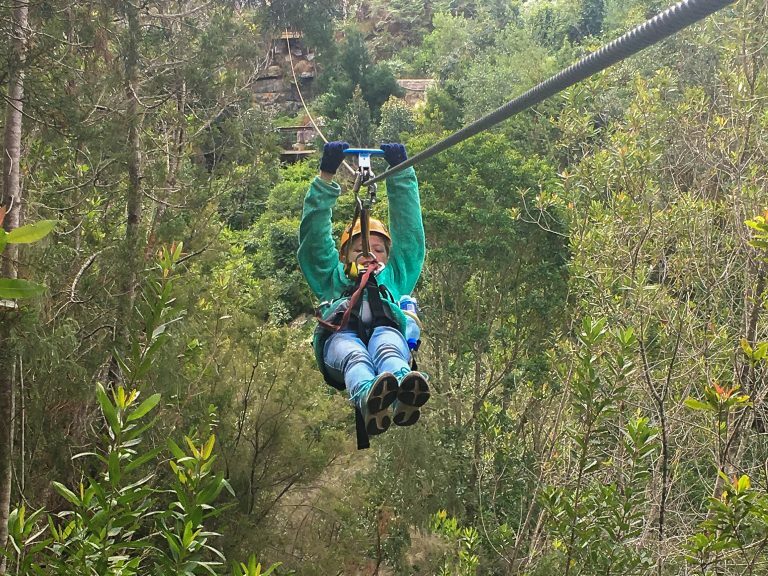 A visit to the zip lines at Tsitsikamma Falls Adventures was recommended to us by fellow travelers on the Garden Route South Africa. When we had an extra hour or so in the area, we decided to stop for some zip lining. Tsitsikamma Falls Adventures had us zipping through the air 15 minutes or so after our arrival. Drop-ins are welcome. We signed our paperwork, and we were good to go. The lines at Tsitsikamma Falls Adventures zigzag across a canyon complete with several waterfalls. I’ve done several zip line tours and Tsitsikamma Falls Adventures is one of the more scenic courses that I’ve experienced. The staff even took photos of us on our phones as we zipped. In the United States, most Segway tours require riders to be teenagers or adults. 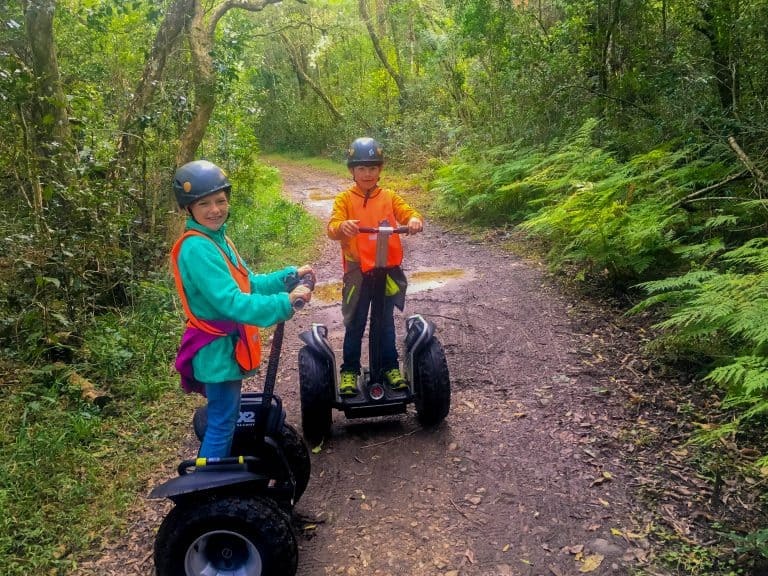 However, Tsitsikamma Segway Tour allows much younger kids to participate. My 8 and 9-year-olds easily met the height requirement and quickly learned to balance themselves on the Segway. 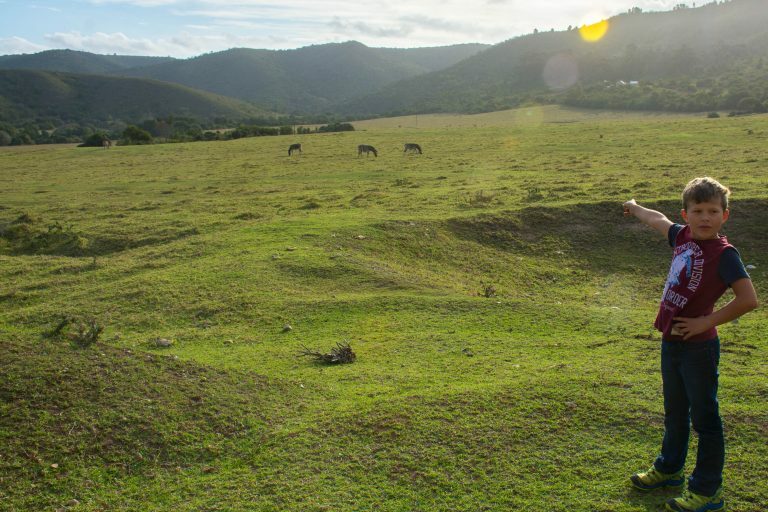 The Tsitsikamma Segway Tour route goes through the small town and then through the rainforest on relatively flat pathways. The whole family enjoyed the novelty of our Segway adventure. 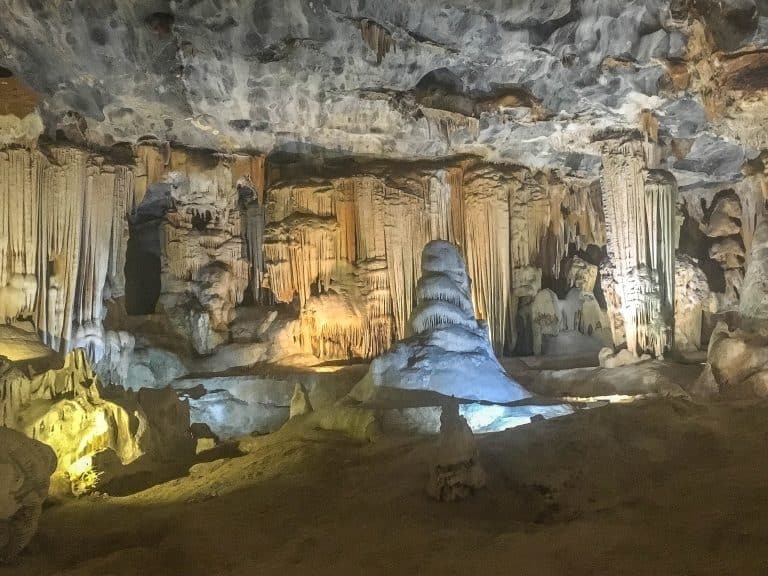 While technically not part of the Garden Route, Oudtshoorn has become a popular stop on a Garden Route South Africa vacation. It has a convenient location between many of the top Garden Route destinations and Cape Town. 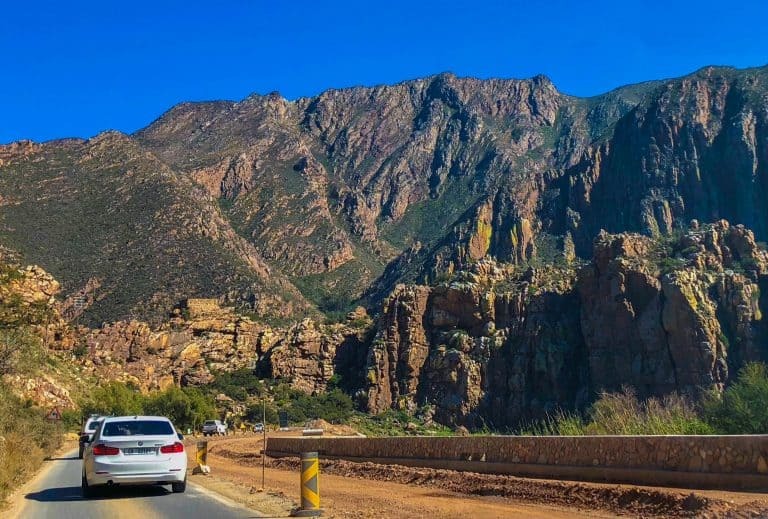 The drive out to Oudtshoorn is a scenic one too! Oudtshoorn is popular with tourists for its ostrich farms. 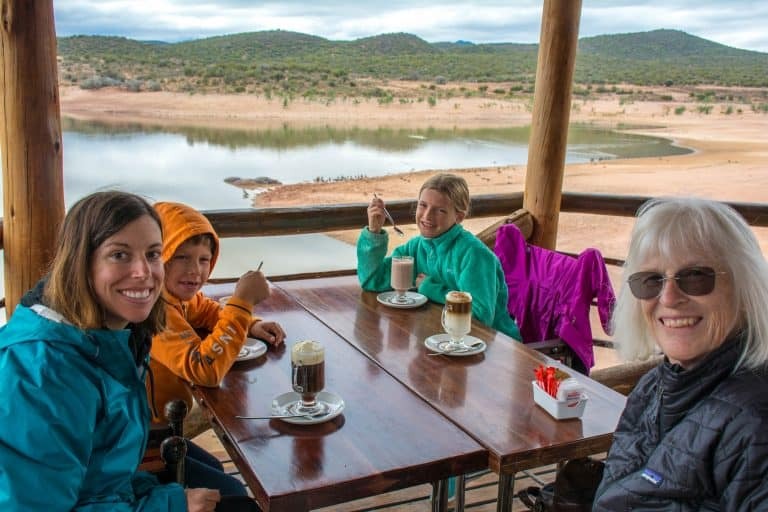 However, our family chose not to visit the ostrich farms and still found plenty to see and do in Oudtshoorn on our South Africa itinerary. 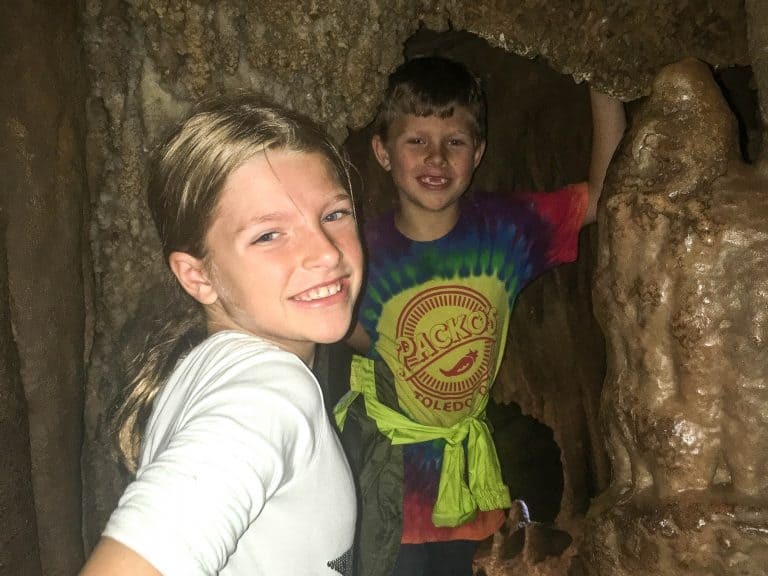 The Cango Caves Adventure Tour is unlike any adventure tour you’ll take in the United States. A single guide shows guests through tight passageways that lie beyond where the Heritage Tour takes most guests. Adventurous tourists have been going through this route for generations so this particular area of the caves is not well preserved. Many visitors’ hands have grasped the stalagmites to pull themselves through the rocks so the cave does show some damage. There is an element of adventure and danger as one maneuvers through tiny spaces to explore the cave as thousands have before them. Some of the spaces are more difficult for children as they must reach further to pull themselves up. Other areas are easier as they can more easily slide through the small spaces. After completing the adventure tour, my children and I all felt a definite sense of accomplishment. 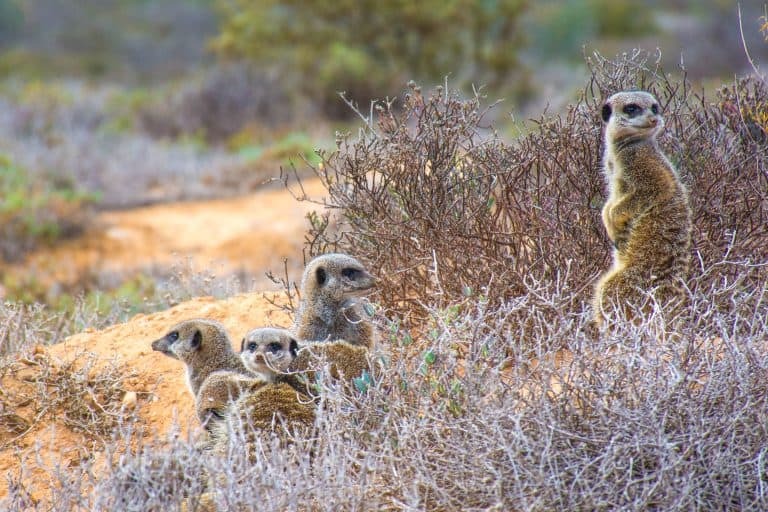 If you have an animal lover in your family, a morning watching the meerkats awake and emerge from their burrows might be a fun way to spend a few hours in Oudtshoorn. A few tour operators offer meerkat tours. We chose Meerkat Adventures. Children must be at least 10 years old to go with Meerkat Adventures. Our tour guide was quite entertaining. However, children do need to be mature and quiet as they wait. Spectators observe one meerkat, then two or three coming out of the burrow. Finally, all the meerkats scamper off into the desert to find food. During our time in Oudtshoorn, we stayed at Africamps Klein Karoo. Africamps are a relatively new chain of glamping options across South Africa. During the middle of winter, the tents were a bit chilly and it was difficult to cook outdoors due to the wind. However, Africamps is a fun and memorable place to stay with the family on a South Africa vacation itinerary. We loved that breakfast and dinner provisions could be ordered ahead of time, and they were in our tent prior to our arrival. 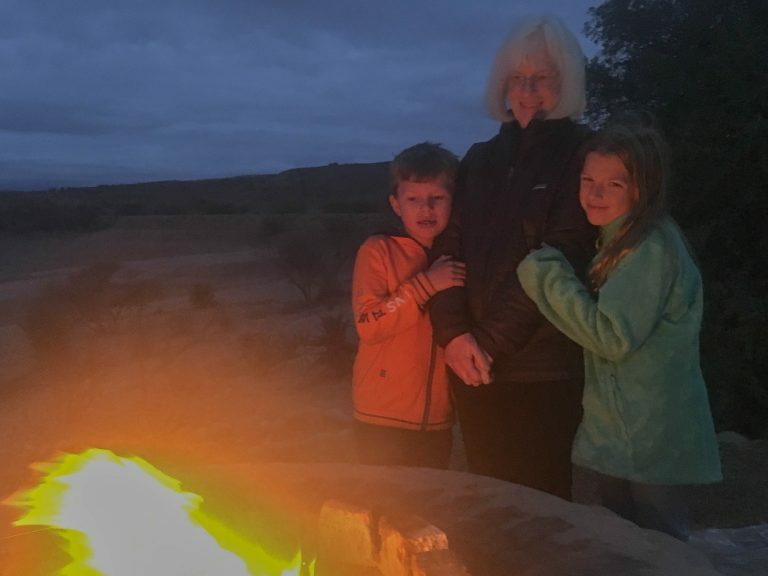 Africamps Klein Karoo is very family oriented with a schedule of possible tours, a playground, and plenty of places for the kids to safely wander and play. Bufflesdrift Game Lodge is another family-friendly accommodation option for your South Africa itinerary. We did not stay there but we did eat at their popular restaurant that overlooks a watering hole. If you have not had the opportunity to go on safari, a lunch at Bufflesdrift Game Lodge is a must do in Oudtshoorn. Even if you have gone on safari, it’s fun to watch the hippos as you eat lunch. Our final stop on our South Africa vacation itinerary with kids was in wine country just about an hour outside of Cape Town. We stayed and spent the day in Paarl before catching an evening flight back to London. The major tourist attraction in Paarl is a collection of shops and tasting rooms called the Spice Route. Families can let the kids play at the playground after a meal at the pizzeria overlooking the vineyards. Wine Country in South Africa is stunningly beautiful with sharp mountain peaks towering over vineyards. 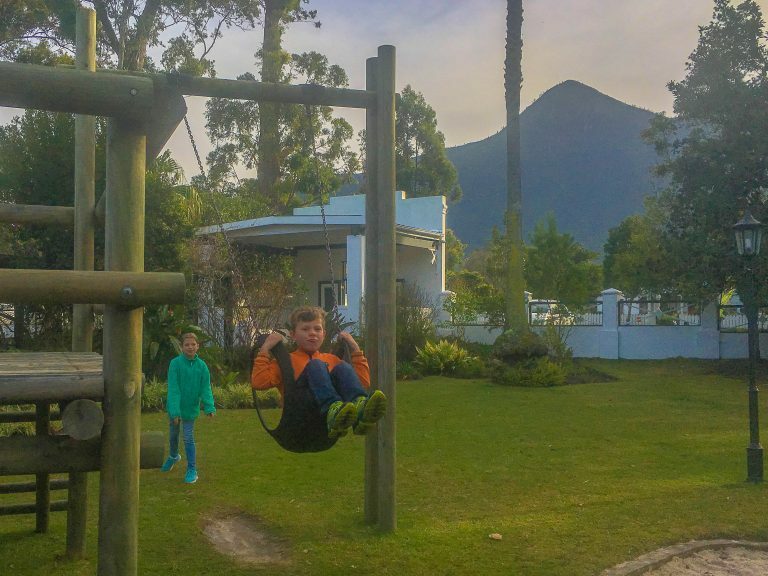 Taking an hour or two to simply enjoy the view on a South Africa vacation is a lot easier with playgrounds for the kids and a good kid-friendly restaurant. Older children will also love the chocolate tasting room. For a small per person fee, families can taste chocolate from around the world with a short narrative given by staff at the store. Finally, there is an ice cream shop that also sells coffee. 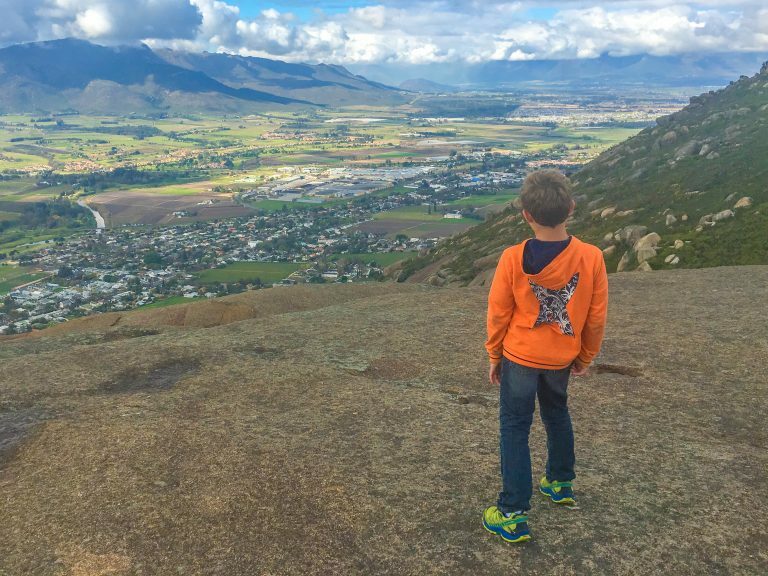 While dining is surely the highlight in Paarl, families can drive up to Paarl Mountain for a hike and a view. Kids can explore among the boulders and parents can burn off a few calories from lunch or dinner chasing them around.